Founded in 1934, United Technologies (UTX) is a global industrial conglomerate that provides technology products and services to building systems and aerospace industries worldwide. The company operates four main segments, some of which have existed for as long as 90 years (Pratt & Whitney) and 165 years (Otis elevators). Climate, Controls & Security (29% of sales, 36% of profit): builds heating, ventilating, air conditioning, and refrigeration solutions for residential, commercial, industrial clients. This segment also designs electronic security products, including: intruder alarms, access control systems, video surveillance systems, and fire safety products. Pratt & Whitney (27% of sales, 16% of profit): supplies, maintains, and services aircraft engines for commercial, military, business jet, and general aviation markets. 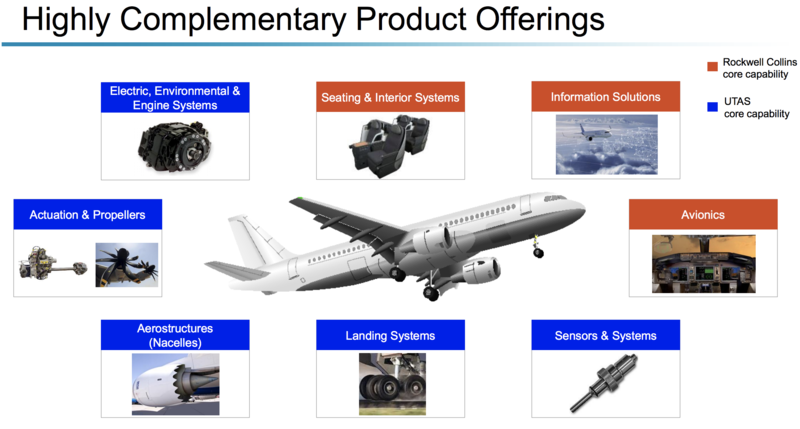 Aerospace Systems (24% of sales, 26% of profit): air data and aircraft sensing systems including engine control, intelligence, surveillance, and reconnaissance systems, environmental control systems, fire and ice detection, and military protection systems. This segment is also involved with space products and subsystems. Otis (20% of sales, 22% of profit): designs, manufactures, sells, installs, services, and maintains passenger and freight elevators, escalators, and moving walkways. Otis services over 2.5 million elevators around the world that move nearly 2 billion people a day. The company has 15,000 global technicians servicing 1.8 million elevators each year. After the $9 billion sale of its Sikorsky helicopter business to Lockheed Martin (LMT) in 2015, United Technologies' business has much less exposure to the defense industry, with its sales dominated by industrial, commercial, and commercial aviation. The company also enjoys strong geographic diversification with the majority of sales coming from outside the U.S. There are several factors that make United Technologies a strong investment candidate for dividend growth investors. For one thing, the company has become very focused over the decades, choosing a "quality over quantity" approach to growth. For example, United Technologies has focused its business on the industries in which it has the No. 1 or No. 2 market share. The company's impressive market share positions are the result of its sticky ecosystem, which creates an enduring competitive advantage. More specifically, United Technologies not only sells its clients various industrial products, but it also offers long-term service contracts to maintain their business over the years. For example, 80% of Pratt & Whitney jet engines are sold with long-term (up to 30-year) service contracts, creating a highly stable recurring revenue stream. Approximately 60% of Otis' revenue is from service contracts, and in total more than 40% of the company's revenues are derived from these long-term service contracts. Better yet? The aerospace business is increasingly shifting its focus from just selling OEM parts to a more comprehensive fleet management system. In other words, its mix is shifting to favor more long-term comprehensive service contracts spanning numerous aspects of maintaining aircraft and engines. By 2020 management expects aerospace's high-margin aftermarket service business to make up 60% of its revenue, up from 45% today. In addition, many of the company's industrial clients face strict regulatory safety and quality standards that must be met, such as in commercial and military aircraft. Combine this with the fact that switching suppliers can lead to logistical nightmares, and you have a business model in which customer loyalty (and decadeslong service contracts) helps preserve pricing power. United Technologies also has a competitive advantage in the sense that the highly capital intensive and specialized nature of its businesses means it faces fewer rivals on a global scale. For example, designing jet engines is notoriously expensive and time consuming, with Pratt & Whitney's latest engine taking 20 years to develop at a cost of $10 billion. The incredible amount of technical sophistication involved with producing fuel efficient, reliable machines and safe jet engines is why this industry is effectively dominated by just three global giants: United Technologies, General Electric (GE), and Rolls Royce. To maintain a strong edge in engineering, United Technologies usually partners with customers to fund R&D. The company typically spends 4% of revenues on development of improved technologies, with customers contributing their own 3% to 4%. Another benefit from being an industry leader is economies of scale. This means that United Technologies is able to leverage its sheer size to reduce production costs and optimize its supply chain. The company sources the cheapest components that meet its high quality standards, from all over the world. And by ordering in bulk, its suppliers often give it price breaks. United Technologies' large scale and manufacturing excellence allow it to create much of its large equipment at extremely competitive costs. The company isn’t interested in the margin it makes on the initial equipment sale, which is often minimal. As previously discussed, the real money is made in aftermarket parts and services contracts to keep engines, elevators, and other high-value equipment up and running. Smaller competitors are unable to match United Technologies' pricing for initial equipment sales and don’t have the seal of reliability and performance that many of the company’s famous franchises have built up over decades of time. Otis is a perfect example with its lengthy operating history and massive installed base. Third-party elevator servicers often try to compete on price. However, smaller companies have a tough time achieving sufficient profitability because they usually have fewer contracted elevators in cities where Otis has a presence. Otis can run its service operations more efficiently thanks to the density of its network (similar to a trash collection company, in a way). Specifically, the company's technicians do not have to travel as far to get to their next job since Otis tends to service more elevators per building and per city than its peers, better utilizing their time. Thanks to its service-heavy business model, economies of scale, and technology advantages, United Technologies enjoys above-average profit margins and a healthy free cash flow margin around 10%, helping it convert its growing revenues into cash that can be used to reward dividend investors. In fact, United Technologies has reliably paid a quarterly dividend every year since 1936. The company has also raised its payout for 24 consecutive years and will become a dividend aristocrat when it raises its dividend in 2018. Of course, all industrial companies will face challenges from time to time. Between 2013 and 2016, a global industrial recession forced many industrial conglomerates to refocus their business models. United Technologies struggled to grow its revenue and earnings as it dealt with a slowdown in Chinese infrastructure spending (bad for its Otis elevators business), currency headwinds, government sequestration, and rising production costs in its aircraft engine business. Embarked on an aggressive $1.5 billion cost-cutting effort (designed to reduce costs by $900 million a year) to raise margins on its faster-growing remaining businesses. The realignment of United Technologies' capital allocation plans has prioritized maximizing the company's profitability in faster-growing industries, especially commercial aviation. Thanks to a recovery in the global industrial sector, organic sales growth has picked up in recent years. This was led by a 25% increase in Pratt & Whitney's commercial aftermarket business. United Technologies has historically been highly disciplined in its approach to growth. That means striving for profitable organic growth rather than fueling sales, earnings, and cash increases through acquisitions. But that's not to say that management isn't willing to make big deals. For example, in 2017 United Technologies announced it was buying rival aerospace gigant Rockwell Collins (COL) for $30 billion. The deal will be 67% cash (including taking on $14 billion in additional debt) and 33% stock, and was recently approved by Rockwell shareholders. Pending regulatory approval, the deal is expected to close around mid 2018. United Technologies managed to get what seems to be a reasonable price, paying just 13.9 times 2018's projected EBITDA, and expects the deal to generate internal rates of return of 8%. Management also expects the deal to become accretive to adjusted EPS by 2019, before the company completes the $500 million of annual cost synergies it targets by the end of 2021. While many large corporate acquisitions ultimately prove misguided, United Technologies has a good history of timely and well-executed mergers & acquisitions. For example, in 2011 it paid around $18 billion for aerospace company Goodrich Corporation. At the time United was projecting $375 million in annual cost synergies and actually achieved $600 million in annual cost savings. Acquisitions that fit well into its core business units are a large reason why United Technologies component sales per plane have tripled to more than $3 million in less than 20 years. This includes new components such as landing gears, interiors, propellers, wheels, brakes, and electronics. The Rockwell acquisition is expected to increase that figure even further thanks to its presence in complementary areas. Rockwell Collins will boost United Technologies' revenue base by 15% immediately, mostly increasing the company's exposure to the fast-growing commercial aerospace industry. Commercial aerospace is expected to expand nicely over the decades ahead because fast population and economic growth in emerging countries will result in more demand for global travel and thus airplanes. In fact, according to Boeing (BA), in the next 20 years over 41,000 new jets will be delivered to global airlines, tripling the number of commercial jets in operation. United Technologies is also set to benefit from increased urbanization, especially in emerging markets. As more people move to cities, demand for reliable heating and cooling systems, as well as elevators, is likely to grow quickly. As a leader in both industries, United Technologies could enjoy a long earnings and dividend growth runway from these trends. Overall, United Technologies is a diversified collection of well-run businesses, with a proven ability to adapt to challenging industry conditions over time. More importantly for dividend investors, the corporate culture has been very friendly to shareholders as demonstrated by the company's long-term dedication to safe and growing payouts. As a result, United Technologies could be a potentially good fit for most income growth portfolios. However, investors do need to be aware that, like all companies, United Technologies faces its fair share of risks and challenges. The thing to remember about any industrial company is that sales, earnings, and cash flow can be highly cyclical. When the global economy slows, many companies pullback on spending, especially on high-priced industrial equipment. Fortunately, United Technologies' strong focus on aftermarket service contracts (large equipment must continue being serviced to keep it operating) means that its sales and cash flow are less volatile than most of its peers. Another important risk to keep in mind is that United Technologies is just one part of a global industrial supply chain. While the company enjoys large economies of scale, so do many of its biggest customers. For example, Pratt & Whitney derived 38% of its sales from Airbus and 21% from the U.S. government in 2017. Meanwhile, Boeing and Airbus accounted for 37% of the company's aerospace unit revenue last year. These large customers have strong pricing power over suppliers, which can lead to pressure on United Technologies' margins at times. Profitability can also be squeezed due to the technologically complex nature of its businesses. Take, for example, the Pratt & Whitney PurePower PW1000G Geared Turbofan engine, which was released in 2016 after spending two decades in development. The engine is the company's latest generation model with aluminum-titanium fan blades that are designed for "significant reduction in fuel burn and noise levels with lower environmental emissions and operating costs." However, this engine faces several challenges, including a longer manufacturing time because blades take twice as long to build as previous versions. In addition the new engine is having reliability issues. According to Airbus (Pratt's biggest customer) CFO Harald Wilhelm, these engines have faced "a number of in-service issues" that make its performance "not satisfactory." Pratt & Whitney expects that the extra costs of fixing these problems will mean that these jet engines won't achieve profitability until 2020. Fortunately, production is just ramping up with just 374 deliveries in 2017. This means that the company has time to fix the engine's problems before production scales up to far larger quantities. By the time United is delivering these jet engines quickly, they should hopefully be profitable. Finally, the Rockwell Collins acquisition may prove harder to pull off than management believes. That's because this is the largest deal in the company's history, and also CEO Greg Hayes' first such giant acquisition. The price United Technologies paid appears reasonable. However the 7% share dilution needed to finance the deal means that United Technologies will likely need to achieve those full $500 million in cost synergies by 2021 to make the deal work for shareholders. While United has a good track record on merger synergies, success isn't guaranteed. For example, previous cost cutting efforts, including a botched merging of the Otis and Climate, Controls and Security units, didn't work and had to be abandoned. Overall, it's hard to identify any one risk that could jeopardize the company's long-term fortunes due to United Technologies' diversified sources of cash flow and conservative management team. As an industry leader and future dividend aristocrat, United Technologies has more than proven itself to be a blue-chip industrial stock that conservative income growth investors can likely trust over the long term. A skilled management team, numerous competitive advantages, and accelerating organic growth make strong earnings and dividend growth likely over the next few years. Even though the industrial sector is cyclical, United Technologies' solid balance sheet and relatively large amount of high-margin service revenue mean that its payout should remain safe and growing for the foreseeable future.